Earlier today, we reported about Edward Niedermeyer's article accusing Tesla of obstructing The U.S. National Highway Traffic Safety Administration (NHTSA) from investigating a suspension issue by making a 2013 Model S owner, Pete Cordaro, sign a non-disclosure agreement. As we concluded in our previous article, Niedermeyer's accusations were full of loop holes and unrelated coincidences that did not add up to his story. Edward claims to be an auto-industry analyst, he is a contributor to Bloomberg's View and the co-founder of Daily Kanban where he previously wrote a 2008 blog titled "Tesla Death Watch," counting the days until Tesla’s death. His article was unfortunately blown out of proportions and picked up by national and international news outlets, leading some to report that Tesla's shares had their "biggest drop of 2.6 percent to $229.36 since May 9." 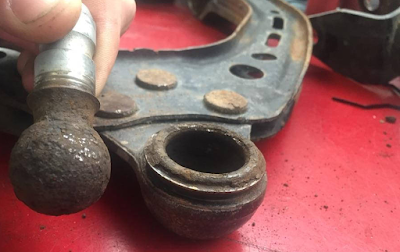 Even though NHTSA was looking into this particular case of ball joints failure on the Model S in question, it did not claim to have opened an investigation since this was a one off case and other Model S owners have not reported this issue to NHTSA before. That's why Tesla and Elon Musk felt the need - as we have hoped - to respond back at Niedermeyer and clear up the story before it goes out of hand. And surely they have tackled all the points Edward was claiming in this article, clarifying that "its owner lives down such a long dirt road that it required two tow trucks to retrieve the car. When we got the car, it was caked in dirt," and even explaining why Tesla sometimes has to resort to signing a non-disclosure agreement when offering to repair a vehicle's out of warranty damage. Before reading Tesla's response, we invite you to check out the short version of the story in our previous article, or head on to Daily Kanban's page for the full version riddled with puzzling information. Here is Tesla's response to Daily Kanban's article titled "A Grain of Salt". Featured image: Tesla Motors Club. Nice point that owning the service centers gives Tesla better data than the dealership scheme. Who wants to bet that a lot of the funding to Mr Niedermeyer tends to have grease stains on it..? It's pretty amazing that someone would abuse a vehicle to the point of separation of the ball joint. Driving on a dirt road with a loose ball joint would have been causing lots of abnormal noises for a good long time before separation could occur. That's one screwed up ball joint. I looks like it was run dry of grease by repeated salt water flushes. We're not even sure that photograph is genuine. This resolves around one complaint with the article overtly inflated with accusations not grounded in fact. What are the conditions, behaviors, actions, and interactions that resulted in the exact failure when and where it happened? There are always people who abuse products and them blame the manufacturer when the abused product fails. And because Tesla is a disruptive agent to the ICE car industry, I would not be one bit surprised that some troll for the ICE car industry would deliberately abuse a Tesla just to create controversy. But the facts are that Tesla is the first manufacturer to ever have a five star rated vehicle in every category. Consumer reports rated Tesla the best car they ever tested (later issuing concerns when Tesla was dealing with the gearbox noise problem....which the pundits also predicted would be the death of Tesla....it wasn't...its fixed...95% of customers say they'd buy another Tesla). And Road & Track magazine wrote that Tesla is the faster car in the world...in normal driving situations....where can you really go faster than 155? Tesla is a world beater, so of course jealous people will make noise....as well as frauds.